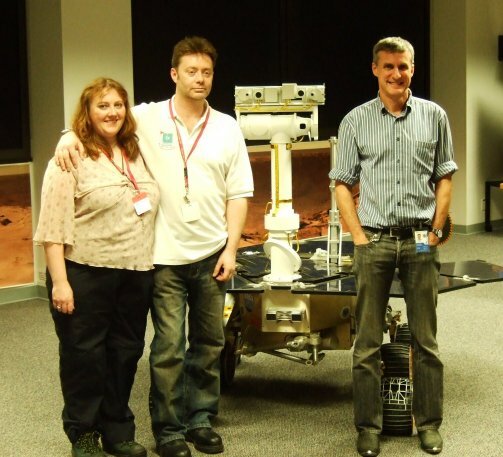 “Road to Endeavour” is written by Stuart Atkinson (middle, above, seen during a visit to JPL), a lifelong space enthusiast, amateur astronomer and frustrated martian. I found your site while searching for more info on the rover. Many thanks for doing it! I live down in NZ but I am originally from Newcastle where I was briefly in the Astro Society there. Not sure if you know Alastair McBeath- a meteor expert. Many moons since I last saw him now. Ready, set — let’s go Team MER Bloggers! This will be fun, Stu. Enjoyed the blog, Stuart. The little rover continues to amaze us all. On to Mars! Wonderful blog . I am a regular (daily) visitor. Do you Know what is happening at the planetary society? All I get is error messages when I try to link to the monthly reports about MER. Hey, Stu. It’s Jim in Sewanee, Tennessee. Just read this article about our little mound in the crater being formed from wind (! ), not deposition from lakes filling and refilling. Kind of bums me out that climbing the mountain probably won’t be profitable in terms of finding more signs of water and potentially . . .